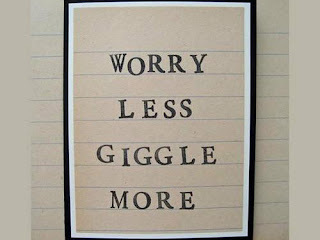 I love this idea - Worry less and giggle more. What a brilliant way to live, don't you think? I believe I should start doing this today!!!! They say that laughter is the best medicine for what ails you and I prefer to be a laughing soul than a depressed one. Perhaps laughter is, dare I say, a secret to happiness. My challenge to you- if you find you are feeling low, find something to make you laugh as quickly as possible. Write down your worry and then throw it away believing that it will take care of itself or that some other power will make it work out. If you can change your worry do so, if not, let it go and find a way to laugh!